Square bowl with rounded corners, slight taper towards base. Typical Sylha spoon shaped perforated handle. Off white matte glaze with brushed pale blue grey overglaze. Brushwork similar to Charles Wilton design. Lightly incised with cross hatched “A” to sides giving an oriental feel to the design. Glazed terra-cotta slip bowl with curved sides to unglazed foot ring. Brown gloss glaze with perforated spoon handle. SYLHA was originally three people; Sylvia Halpern, Artek (Artur) Halpern, and Artur’s brother Stanislaw. Sylvia Pauline Halpern (nee Black), was born in Kobe Japan on the 25th March 1918 and came to Australia in the late 1930s. Artek (Artur) (1908-1976) arrived in Fremantle Australia aboard the “Asturias” on the 6th March 1947. 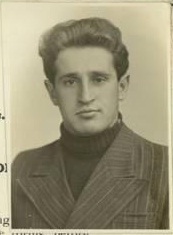 His brother Stanislaw born Zolichev Poland (1919-1969) having arrived in Fremantle before the war aboard the “Otranto” on the 15th of August 1939. The brothers were the sons of Eisig Halpern, engineer, and his wife Berta, née Gutt. Having lost their family property during the Nazi occupation, the Halpern family subsequently filed for compensation along with other family members Leon and Edward Halpern for land in Lvov , then in Poland, now in the Ukraine, taken over by the authorities. With the fall of the Iron Curtain, I wonder if they got it back? Artur worked for RCA in South Melbourne for a time. Sylha stands for Sylvia Halpern, the name given to their output by Artur. Confusion may arise over Sylvia and Artur. She was actually married to Stanislaw on the 28th August 1943 in Melbourne, years before Artur arrived. She and Stanislaw were later divorced after having a daughter who predeceased them. It was Artur and Sylvia who both made pottery using this brand. 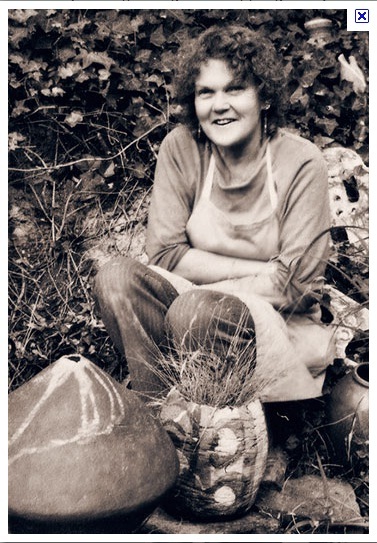 The Sylha Ceramics Studio was run by Artur and Sylvia and was originally located in the backyard at 1 Murrumbeena Parade, Murrumbeena before moving to Natalia Avenue, South Oakleigh in 1950 and then to Warrandyte in 1958 where Artur helped to found the Potters Cottage. In South Oakleigh they employed two Italian potters and working with them, he learnt the skills of mould-making and slip-casting. Artur learned a lot from one of them, Costantino Bacchini (b: 9 September 1921) who arrived in Melbourne in 1952 under the Australian Italian Migration Agreement. West-Australian potter Mike Kusnik also worked there in 1959. Artur had qualified as an Engineer in Czechoslovakia and in 1950, built the electric kiln they used. Artur and Sylvia later moved to Dingley Dell, Warrandyte and joined the Potters Cottage (in 1961). Sylvia Pauline Black had studied at RMIT under Klytie Pate and John Barnard Knight in 1944-45, and then later taught Artur and his brother, her former husband Stanislaw. Artur, an engineer built their first kiln (electric) and used Sylha as his brand. Several kilns were later built and in a relatively short time Artur and Sylvia was earning a full time living as potters, although it appears that Sylvia was the major partner with Arthur the marketing person. Not one to do things by halves, Artur imported great quantities of glaze colours from England and Germany as these were unavailable in Australia at the time. Like most makers of the day, their sales were made through department stores to whom they sold direct. Artur sold mainly through the Primrose Pottery Shop in Melbourne (see the post for them). Most makers did not advertise, leaving that up to the stores that sold their ramekins. Sylvia signed hers “Sylvia Halpern”, not to be confused Stanislaw who signed his pieces “shalpern”. The family tradition continues with daughter Deborah also taking up pottery after being “apprenticed” to Artur. The five founding members of the Warrandyte Potters Cottage, from 1958 were Reg Preston, Phyllis Dunn, Artur Halpern, Gus McLaren and Charles Wilton; three other members joining in 1961 were Sylvia Halpern, Elsa Ardern and Kate Janeba. The only founding member who was not a potter was the architect John Hipwell who acted as the group's President. A group of students from this pottery school went on to form their own co-op, Stonehouse Potters in 1972, which is still flourishing. As well as the significant numbers of potters in the region, the Pottery Expo in Warrandyte each autumn highlights this important artistic tradition. Stanislaw deserves his own story, but not here because he didn’t make ramekins. Look him up, he is one of the great underrated artists of Australia.